Are you tempted by motorcycling, but intimidated by the aggressiveness of today's bikes? How about a simple, comfortable bike that is easy to ride and maintain, quick enough to be fun, but unlikely to scare you? The good news is that just such a machine exists, the Honda Pacific Coast that you see here and it is absolutely superb. The bad news is that you have more chance of being hit by lightning than finding one, as Honda do not sell it in this country, more's the pity. 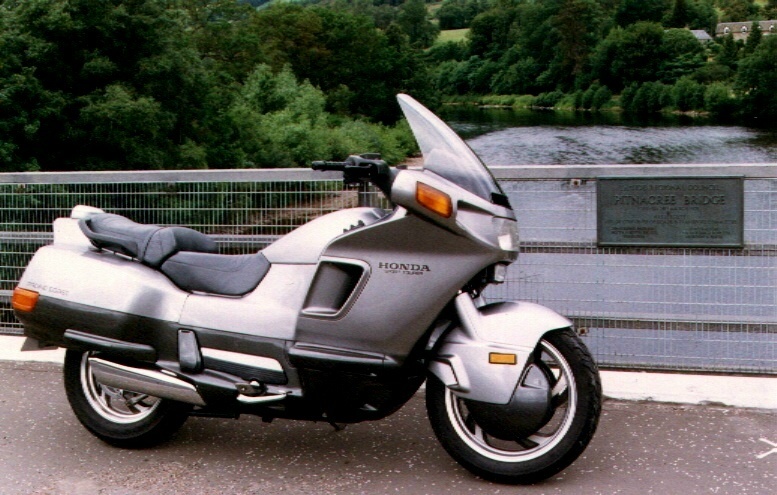 In the late Eighties the world's biggest bike maker, Honda, decided to design the perfect bike for non-bikers, even going so far as getting their car stylists to design it. The result was the PC800, better known as the Honda Pacific Coast, in testimony to the Californians they hoped would buy it. Honda shipped boatloads of them to the States, but the car driving public ignored it, and the traditionalist bikers didn't understand it. Honda had egg on their face, and a lot of unsold bikes, and rather than risk further embarrassment by selling the bike world-wide, the whole project went quietly onto the back burner. The die-hards had won, and thus was the UK denied the pleasures of one of the most delightful 2 wheelers ever built. So why have I been enjoying this rarest of bikes on a sunny morning in Perthshire? Take a bow Mr Sandy Bloy, a name well known in Scottish motorcycle circles, Sandy has been selling and racing bikes for more than a few years now. Spotting a niche in the market, he has set up an outlet in Perth selling used bikes imported direct from Japan. This may seem like coals to Newcastle, but there are all manner of fascinating bikes available in Japan but not sold here, so if you fancy something that little bit more exclusive, Sandy Bloy is your man north of the border for such bikes. This PC800 is the first one that even Sandy had seen, so rare are they here, and he kindly volunteered it to me for the day for evaluation. At the heart of the bike is a V-twin 800cc engine, which is a gem. It is quiet, unobtrusive and just brisk enough, and being a Honda should last forever. The bike is completely enclosed in bodywork, just like a car, and although it is quite heavy on paper, it is simplicity itself to move about, and completely unintimidating to ride. The seat is broad and comfy, and even a short chap like me can get both feet square on the ground, a great confidence booster. But best of all is that all encompassing bodywork encloses a boot at the back, again just like a car, and big enough for two helmets and a pile of groceries. The dashboard is entirely car-like, and the controls simple. It is in truth the nearest thing possible to a small, two wheeled car, and of course is sneered at by the motorcycle purists. Fortunately, I am no purist! Easing up the A9 to Pitlochry at the speed limit, the Pacific Coast is possibly the friendliest bike I have yet ridden. It hums along with about as much fuss as you would expect in a Honda Civic. Drop a few gears to overtake and it whips past with ease, not that fast by the standards of other large bikes, but easily on a par with a Honda NSX in that all important 40-70 mph range (and yes, I have driven one), and then settle back to cruise as happily as you would in a leather and wood trimmed Accord. No problems in the cruising and overtaking stakes then, but does it handle? I stop on the Pitnacree bridge to take the photo above the river Tay, and head down one of my favourite roads, the B898 past Kinnaird to Dunkeld. Here the bike has another little surprise, in that if you stay in 3rd and 4th gears it will swing cleanly and elegantly through the bends with a precision somewhere between a CRX and a Prelude, which is high praise indeed. The PC800 may be a bike, but it manages to sum up all the best sensations that Honda engineer into their cars. I am an avowed fan of Honda's cars, so you will perhaps understand why I am enjoying this bike so much. Quite simply, this bike was ahead of its time when it was first launched. It was considered too radical, not "bike-ish" enough, which is why it failed commercially. The word from the States is however that folk are finally beginning to appreciate the PC800 and sales are picking up, meanwhile Honda has quietly slipped it onto the Belgian market too. A handful of enterprising souls like Sandy Bloy ensure that a very limited supply is available in the UK, and Honda appear to have accepted this by making spares parts available here. In my view the Pacific Coast deserves better, and I think its time might just have come. There are now lots of people coming back to biking, and if this bike was marketed properly here I am sure it could win lots of friends. How about it Honda UK?